Phil Rouse Ltd is a South Waikato contracting company with a fleet of seven Caterpillar bulldozers: a 2006 Cat D6 HXL, a 1995 D7 HXL and five D8s. 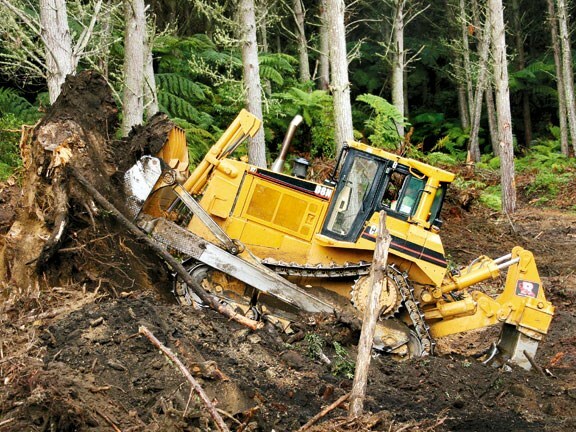 Murray Southorn, the civil/forestry supervisor at Phil Rouse Ltd, took me into the Kinleith forest where the company's 14 year-old Cat D8N was about to clear a "landing strip" in advance of the logging contractors. The D8N uses a 14.6-litre Caterpillar 3406C diesel engine from the 3400 series. The turbocharged and after-cooled six cylinder motor produces 212.5kW (285hp) at 2100rpm (with an unspecified torque rating) from an individual Cat direct injection system. 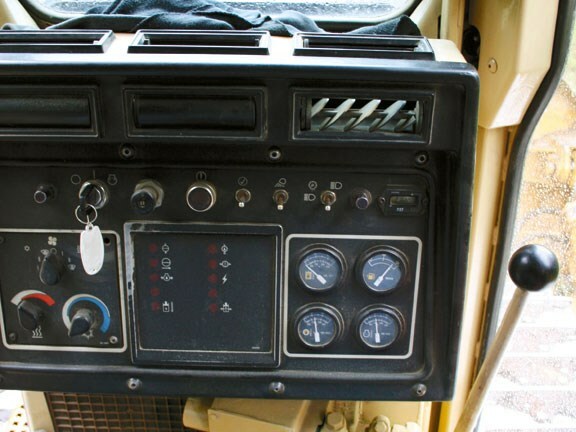 From the 1996 D8N driver's seat, the cab controls seem to be in logical positions. The left-hand joystick, or "tiller", is horizontally mounted and is the main vehicle controller. A dial is located at the end of the tiller for using any one of the three speeds. Push the tiller forwards and the D8N will turn left; pull it to make the big Cat turn right. Turn the "dual-twist" tiller forwards to move in that direction and the opposite to back up. After 10 years driving this machine, Dave Malyon says, "It's comfortable to drive over rough ground with the isolating rollers on the bottom of the tracks, which go up and down. I just like it non-stop." He clocks up about 2000 hours annually. "It's nice and comfortable and has good vision." While moving back and forth, my right hand was busy operating the blade rise/fall to take bigger or smaller bites or position for pushing tree stumps out. With an experienced operator it seems there's little that will stop a big 40-tonne Cat D8N in its tracks. However, learning to operate a bulldozer smoothly comes with time and I struggled to come to terms with using the foot throttle as a decelerator - the complete opposite to an accelerator. With the engine at full revs I had to depress the decelerator in order to slow forward (or reverse) motion when changing direction, but mostly when I was playing with the tree stumps. While the high-track, tri-drive carriage and suspension system improves the overall ride comfort, in a practical sense these features provide better balance and traction under all working conditions. It's hard to go past the trademark power of the big D8's 14.6-litre Caterpillar 3406 engine, and turning was super easy for the large diff steering "dozer" too. Moving the approximately 40-tonne bulldozers around requires the dedicated Mercedes 530hp low-loader truck, which is also kept busy transporting the Phil Rouse Ltd fleet from site to site. Phil Rouse purchased his first two new D8Ns back in 1987, and the pair have clocked up more than 75,000 hours between them! Clyde Rouse says, "They're still going full time in the forest putting in roads and skids. We also bounce them into civil and rural type work wherever it fits." Such a long service life working approximately 2000 hours per year doesn't come by accident. Phil Rouse Ltd has its own workshop and a dedicated service truck for on-site servicing. Plus, at between 10,000 to 15,000 hours, each Cat is zero-timed for a $200,000 cost each - completely stripped to the frame and fully rebuilt including new hosing, wiring and professional spray painting. Caterpillar has been producing the famous D8 bulldozer since 1935. There are many old D8s still in use today, so it's hard to go past that level of manufacturer experience. The current Caterpillar in the D8 category is the D8T. Murray Southorn has worked much of his life in the Kinleith forest and spent 20 years driving Terex motorised scrapers, and more recently, 500 hours in the D8N I drove. "The D8 is responsive and lively, it's pleasurable to drive and easy on the body. Probably the most important thing in this forest is the power to weight ratio, you wouldn't want a D9 out here," he says. "Experience comes down to the operator, but generally they all end up doing the job in the quickest possible time. A lot of the guys working on the motorway pushing out rubble you wouldn't put them out here in a swamp trying to build a road with a blade, because they just wouldn't know how to drive it. The guys we have on our machines, they've done everything, driven diggers, tractors, motor scrapers, they have a good grounding in what the machines can do - the first thing you have to learn." 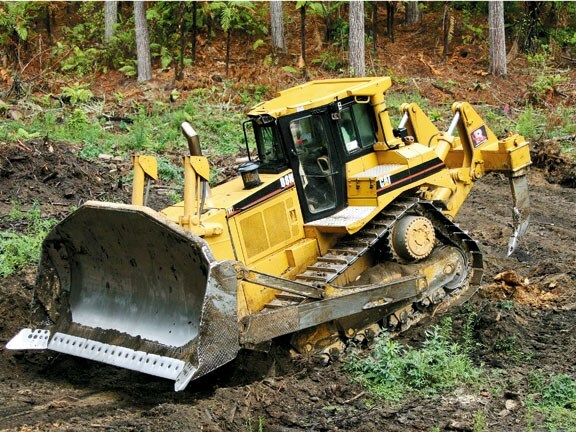 See the Cat D8N for sale.